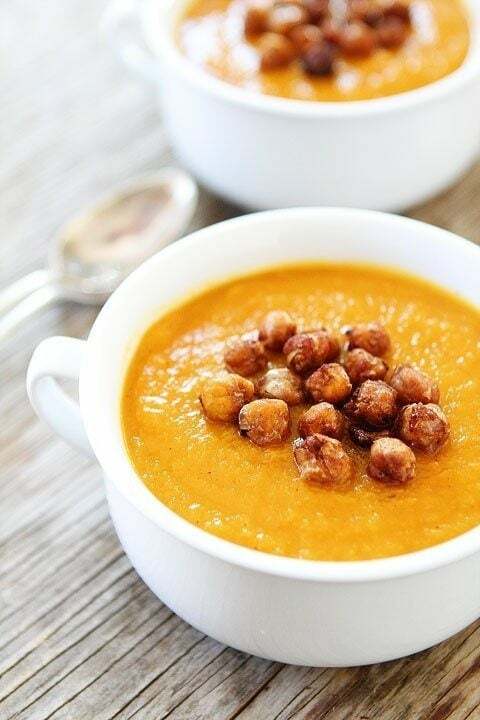 Slow Cooker Butternut Squash Soup with Maple Roasted Chickpeas – a simple, delicious, healthy butternut squash soup perfect for Fall. 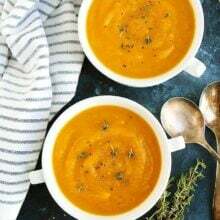 Made with fresh squash, apples, carrots, and onions – this is also a vegan butternut squash soup recipe! 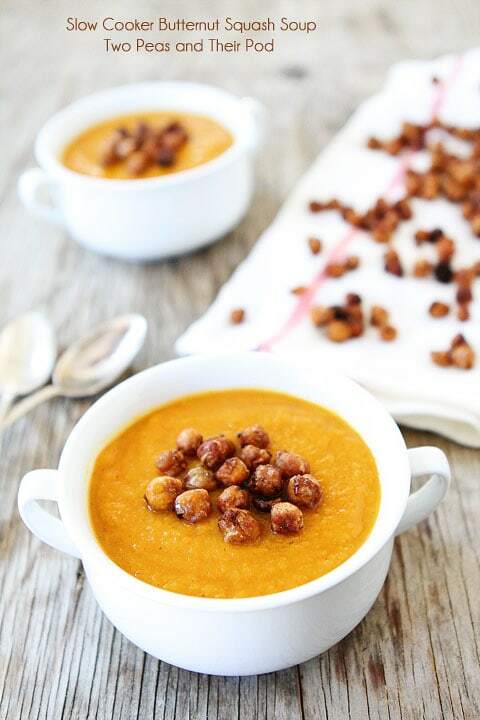 Since this crockpot butternut squash soup is so easy to make, I decided to jazz it up a bit by making Maple Roasted Chickpeas. They are the perfect garnish for the creamy butternut squash soup since it has a touch of maple syrup. I tossed chickpeas with a little oil, pure maple syrup, brown sugar, cinnamon and salt. I roasted them until the were nice and crispy…and then I tried not to eat them all before dinner time. They are SO good and the perfect topping for the soup. Butternut squash soup is one of my all-time favorite soups. It’s loaded with healthy squash, carrots, onion, and apple. It always hits the spot. I love this recipe because you can throw everything in the slow cooker and walk away. In a few hours, you have a tasty soup waiting for you! Oh, and your house will smell amazing while it is cooking away! When the vegetables are nice and soft from cooking in the slow cooker, I use my trusty immersion blender to create a creamy and smooth soup. If you don’t own one, you can transfer to a blender. I add cinnamon, nutmeg, and a splash of maple syrup, the perfect flavors for fall butternut squash soup. I then ladle the soup into bowls and garnish each bowl with maple roasted chickpeas. And…this Butternut Squash Soup is Vegan! This butternut squash soup has it all! It is silky, smooth, and slightly sweet. The maple roasted chickpeas add a nice crunch and are the perfect little “croutons” for the soup. And, this butternut squash soup is healthy and easy to make. 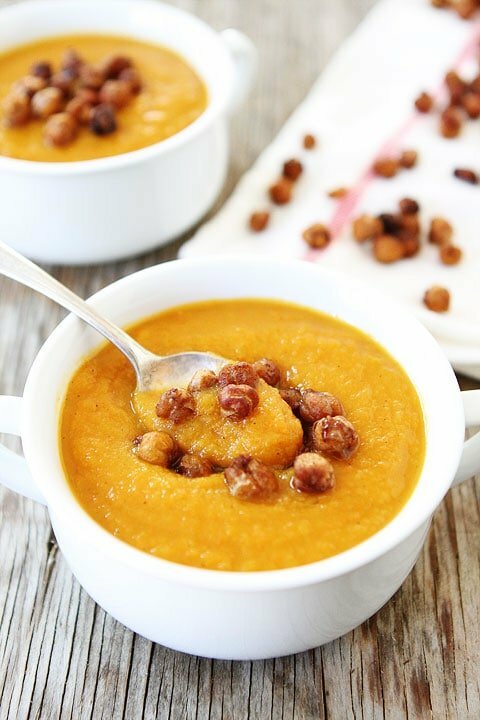 Slow Cooker Butternut Squash Soup with Maple Roasted Chickpeas is a must-make recipe for fall! And if you are looking for a soup to serve at your Thanksgiving feast, let this be the one! It is so easy and so good! Plus, it is vegan, vegetarian, and gluten-free! So if you are having guests with dietary restrictions, they will have something to enjoy! Our favorite butternut squash soup recipe...and the best part? It is made in the slow cooker! Garnish with maple roasted chickpeas for an extra special soup! Add the onion, carrots, butternut squash, and apple to the slow cooker. Pour the vegetable broth over all of the ingredients. Cook on low for 6 hours or on high for 3 to 4 hours or until the vegetables are soft. 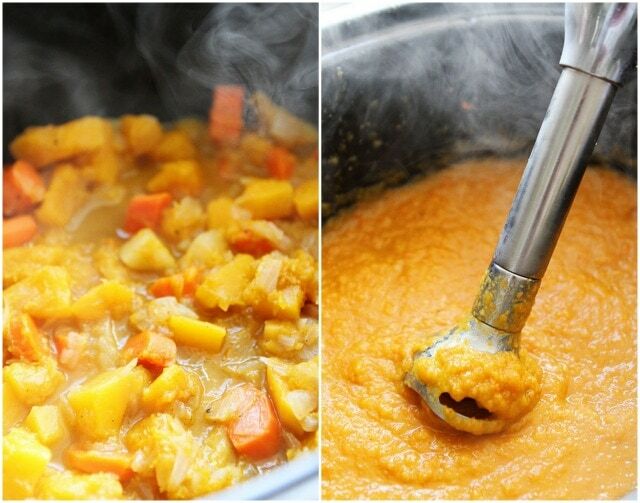 Once vegetables are cooked and soft, puree the soup using an immersion blender. Add the cinnamon, nutmeg, and maple syrup. Season with salt and pepper, to taste. If you don't have an immersion blender, you can carefully transfer the soup to a blender (in batches) and puree until smooth. Pour the soup back into the slow cooker and season with spices and maple syrup. I love making chickpeas like this and could eat a whole baking tray right out of the oven. Love yours! And that soup, too! Pinned! This looks wonderful! I never would have thought to roast chickpeas with maple syrup. I’m going to try it this week. 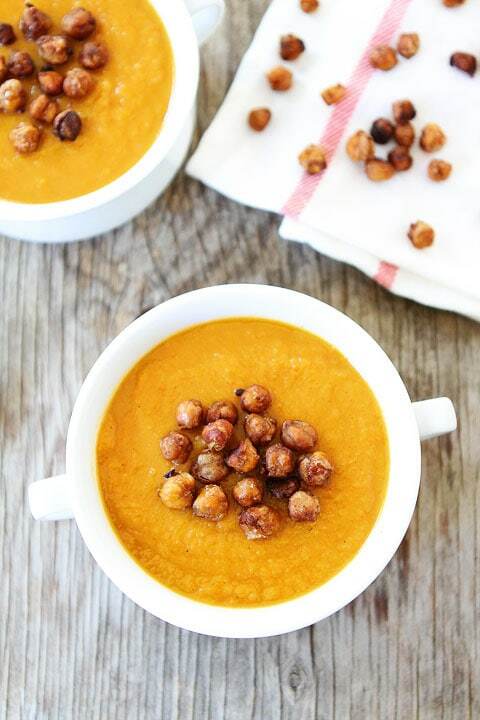 Love Butternut Squash Soup and the Maple Roasted Chickpeas are such a unique garnish – thanks for posting! This soup looks so creamy! My favorite soup is a tomato-vegetable. There is not really a recipe other than tomatoes and veggies…sometimes chickpeas. I just dug out my slow cooker this weekend, too! 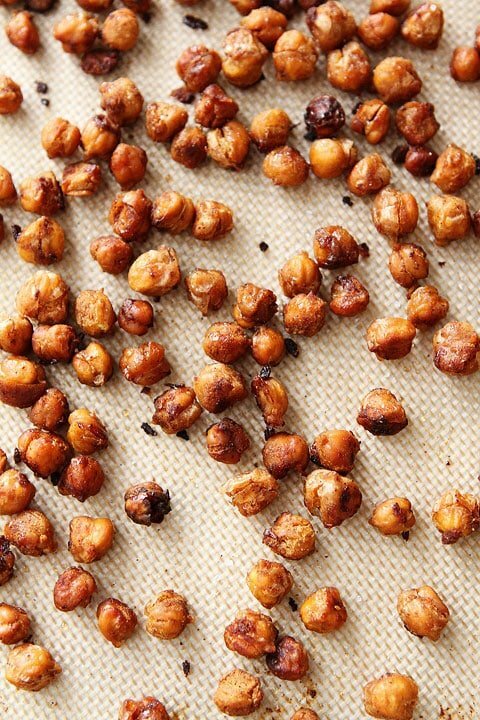 I can’t wait to try these maple-roasted chickpeas. I’m drowning in a mess of clutter myself. Good for you for taking care of it now! This soup looks so good and easy. Yum! Looks delish! I just love butternut squash soup!! One of my favorites! This is perfect. We have been trying to find one vegetarian slower cooker meal as we do our weekly menus. We’ll be making this next week! Mmmmm I love roasted chick peas but have never tried them with maple syrup. I will have to try that. Sounds delicious! Those chickpeas sounds delicious. I’ve never thought of roasting them to be sweet! This soup sounds amazing. Going to try it tomorrow for sure! What a creative way to incorporate chickpeas! Love this! 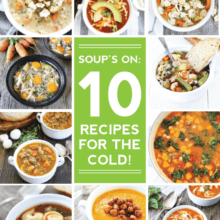 I have a roasted vegetable soup on my blog that’s my favorite 🙂 This soup looks great, too–I love crispy chickpeas! This soup looks fantastic! Perfect fall dinner! This sounds delicious. I just started eating Butternut Squash this year and I love it! Maybe I should make this for Thanksgiving….. I love the idea to use crispy chickpeas instead of croutons or bread in the soup! This looks delicious! I might add it to my Thanksgiving menu. this soup is so pretty!! And i love the convenience of sticking it in the crock pot! The maple roasted chickpeas on top is genius! Yum! I need to make this for a football watching weekend. I love the twist with the chick peas/garbanzos! I love slow cooker meals, I’ve worn out my slow cooker with them!!! 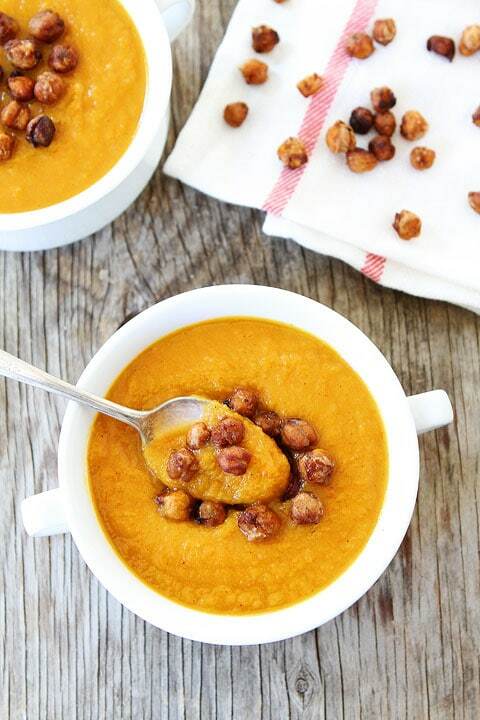 I love butternut squash soup but those roasted chickpeas push this over the top for me! This is going on the menu plan for next week! Yummy!! I think I would easily eat that entire pan of maple chickpeas. Such a great crunchy topper for that gorgeous creamy soup! 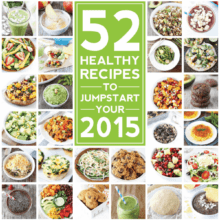 yum – this looks good – my crockpot just broke – this would be wonderful! This sounds incredible! And soooo easy, hope to win the Slowcooker so I can try it along with so many other yummy and festive recipes!! butternut squash soup with some spicy sausage is a go to for me. Never thought to play up the sweetness with maple. Definitely gonna try that next time. Have never tasted a butternut squash but this soup sounds good. Looking for recommendation for an immersion blender that works as well as the food processor or blender. It would be much easier and less messy. Thank you . Sounds like comfort food! Yummy! Gorgeous soup, Maria! I am going to try this recipe right away! I love trying different versions of butternut squash soup. And the maple roasted chickpeas really make this dish stand out from the rest! Butternut squash is my favorite. Gonna try this soup for sure! Love getting new ideas for slow cooker recipes! I love french onion soup! And I really wanna try this squash soup! I LOVE butternut squash soup and this looks perfect!! This looks and sounds very yummy! Oh what a fun fall dish! Can’t wait to try it! Oooh i would love a new slow cooker. Mine is 25 years old. Those roasted chickpeas sounded so good I made some even though I didn’t have a butternut squash around for the soup. But in my oven, they burned at 400. Maybe I’ll try a slower oven. Any suggestions? I did ours at 400 but maybe try 375 degrees. This is definitely going on my Thanksgiving table! Thank you so much! This soup looks absolutely amazing. Come on cool weather get here so I can try this. Yum! This screams fall! 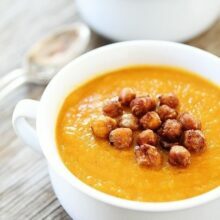 Love butternut squash soup and now will have to try the maple chickpeas! How delicious! I love the roasted chickpeas! I love fall for the squash and pumpkin soups! Also, am a big fan of garbanzo beans. What a creative way to serve these two great foods. Can’t wait to try your recipe. wow…this looks incredible….thanks so much for this recipe! I love slow cooker recipes…who doesnt? I am going to make this next week for sure… will be perfect thing to come home to after a long week of work. Butternut squash is one of my favorite ingredients because it is so versatile. I don’t think it has an extremely pungent flavor either, which makes it easy to introduce to people. This recipe looks like a great one for cold winter nights. I would probably leave out the maple roasted chickpeas though and just add plain chickpeas. I’ve never been a huge fan of the sweet and savory duo. I love soup recipes in the slow cooker. I’ve actually found a lot of dinner recipes for the slow cooker, perfect for the fall/winters here in mn! I love using my slow cooker. Thanks for another awesome recipe to try! Seriously love the chickpea topping!! I am trying this soup this weekend. Thanks so much for this great recipe. Potato with ham is my favorite. The best soup I ever tasted was a butternut squash soup pureed with some chipotle chili and a tiny bit of cream. To. Die. For! The soup looks great! I love Garbanzo beans!! I love your recipes! I’m about to make the chicken with wild rice in teh slow cooker!! Yummy! I tried an Acorn Squash soup at Panera Bread for the very first time this week! I LOVED it! I’m def making this today for dinner! I just made the chickpea and totally burned them 🙁 I baked them as the instructions said: 375 for 50 minutes, stirring a couple of times. I recommended checking them well before the 50 minutes. I think mine could have come out at 35-40 minutes. The soup is in the slow cooker and smelly good. Hoping that turns out yummy! Looks great and I’m looking forward to trying this. I made this today and I have to tell you it is fabulous! I cant quit thinking about it. And, bonus, so incredibly healthy. This looks awesome! I’ve tried this soup a few times, but quickly, with a Vitamix, but I’ve never tried a slow cooker, maybe next time out. I made this soup yesterday (without the chickpeas) – delicious and so easy!! I do want to make the chickpeas next time around (bc I will make this soup again) but I was confused by the last step, mentioning they’re placed on a baking sheet then tossed in a bowl. Should they bake on a baking sheet or in a bowl? 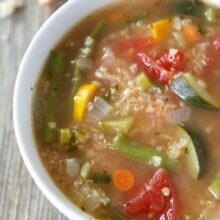 What brand of vegetable broth do you use? Thanks! I like Pacific Foods or Whole Foods brand. I made these and the coating fell off and burned. What did I do wrong? This was definitely easy but unfortunately was not good for me and my family. The texture was more just a baby food type puree than soup. Oh well! I made this for dinner last night and it was absolutely fantastic! I am vegan but staying with my omnivorous family for the week, so I’ve been cooking a vegan meal each night to open them up to how yummy foods can be without meat or dairy. This recipe was PERFECT! Every one loved it and it was gone so quickly!! The chickpeas were the perfect touch! Have saved it and already know I will be making this again and again! Thank you!! Yay! Glad you liked the soup! My boyfriend and I have made butternut squash soup before. Mostly, it’s just bland bland and more bland. This, however, was something completely different. It was so nice just getting to throw it in the slow cooker, and having the option of how long we wanted to cook it for (we did about 4 hours on high.) It was delicious! And the chickpeas were a fantastic way to break up the monotony of the same textured soup, while still remaining healthy. Will definitely make again! The only thing is, when cooking the chickpeas, be sure to use a sheet pan you don’t hold near and dear. Ours took hours to scrub off the scalded maple syrup haha. Would love to know what you could use if one (me!) doesn’t have an immersion blender? Just a regular blender? Kitchen aid? I’m new to cooking so thanks for bearing with me!! soup recipe is solid, though I think I might skip the apple in the future (I found the flavor a little overpowering). I had the same experience as another reviewer regarding the sugar in the chickpeas starting to burn before they got crispy. I think it the future I would roast the chick peas and make a glaze on the stove and the coat the roasted chick peas and bake for just a couple of minutes to brown. I am really wanting to try this recipe. I do not have a slow cooker, however. Any thoughts about how to cook on stove top? BTW, I am new to your website and have really loved your thoughtful recipes and beautiful photography of the food. Very enticing! Well done! You can make it on the stove top! Just use a big soup pot! Looks delicious! Any suggestions for what to substitute the apple with. I have a tree fruit allergy. Thanks! I also burned the chick peas. I am going to try again at 30 minutes instead. Think that might do the trick. Made this today! The soup turned out pretty well… I feel like it’s missing something but I can’t quite put my finger on it. The chickpeas would be the PERFECT garnish if only mine didn’t come out burnt to a crisp 🙁 Not sure where I went wrong. I plucked the few salvageable ones for my own test-bowl, and I wish they had all turned out, they really make the meal! Made it tonight except I omitted the chickpeas only because I didn’t have any on hand. I did garnish with dried cranberries instead. I cooked the soup how you said and it came out delicious! I just added some pumpkin pie spice and some brown sugar because I like my butternut squash soup to be a little sweeter. I also added half vegetable broth and half water. I didn’t have an immersion blender so I used my food processor instead..takes more time but came out perfect. I’m going to try to freeze some for those cold winter nights…Thanks for the easy and healthy recipe! Wow, this sounds so good! My daughter cut up and froze some butternut squash chunks! We should make this soon! Can the chickpeas be made a few days ahead ? How should they be stored? Thanks! Would you happen to know the nutritional value of this meal? This was delicious. This looks great! Do you think it could be made ahead of time and frozen? Or just kept refrigerated? I made the soup and its delicious. I froze it to use at a dinner party next week. I’m hoping to get an answer about the chickpeas. The soup is very healthy. No fat and only about 25 calories per serving for the maple syrup. The test is just vegetables and fruit. Great soup!!! I knew it was a success when some of my more skeptical and picky eaters ate it and said the roasted garbanzo beans tasted better than croutons! Thank you for the great recipie! Delicious! Very creamy, yet no dairy – a real win. Since the soup is slightly sweet, the syrup on the garbanzos is probably not necessary, but loved the crunch they provided. YUM! Just made this last night and I loved it, what an amazing way to use our CSA butternut squash. The hint of apple is really just delightful, I used 2 small sweet red apples and they really picked up the cinnamon nicely. Thank you! can this recipe be double and still fit/cook properly in crockpot? Just wanted to let you know I served this at Thanksgiving yesterday and it was a smash! I was looking for a vegan dish that was not too “in your face” to serve to a diverse group (food likes wise) and this was it! From the strictest vegan to the biggest carnivore, everyone LOVED it. I cheated and used fresh cleaned and cut butternut squash that I found prepackaged in the supermarket. Definitely a keeper! For Allison- Doubling should be no problem if you are using a large one (6 quart) . I tripled the recipe and needed a second smaller crock pot. This is my favorite butternut squash soup. Thanks for the recipe! I share it with everybody. This soup was really good! I loved the chickpeas. But it had an applesauce consistency, how would I make it smoother and creamier, and not so applesauce-y? You can add more liquid to think it out! I tried this, did double the recipe as it sounded so yummy. The soup was a bit sweeter than I thought it should be, although very good. The taking off of the out layer of the chickpeas had to be done by hand which took a bit (given I did 2x) but was worth it. Thanks for the great vegan suggestion. Will share! Just pureed the soup and mine has turned out doo-doo brown! I cooked it on high for 3.5 hours and followed the directions to a T. Do you the think the squash were just overcooked? Has this ever happened to you? The soup is fantastic! I added some cayenne to the chickpeas before roasting and that little hint of heat really cut through the richness of the soup! I also served with a bit of chevre, again to add a different texture and to add a tartness. If I double the recipe, do I still cook the same time or do I need to increase the time to cook? You might need to cook a little longer, maybe plan on 30 minutes extra just to be safe. Can you tell me how many calories in a serving? Pingback: 30 Simple Slow Cooker Meals to Make Dinner Delicious! I want to make this tomorrow, I am prepping the slow cooker now and I made a mistake and added the spices and maple syrup with the uncooked vegetables. Will this make a difference in the taste or be a problem? Should I rinse off the vegetables? It should be fine. Enjoy! This soup is delicious! And those chickpeas………………they vanished almost before the soup was served. We loved both dishes and will make them often this fall. This sounds delicious. And I just happen to have some butternut squash…sounds yummy with the roasted chickpeas with maple syrup. Can’t wait to make this. This is a wonderful butternut squash soup recipe. I made one change – added 1/2 block of cream cheese at the same time as the spices and maple syrup.